Darksign is a special tool item in Dark Souls 3. The Darksign is the sign of an accursed Undead. Carriers of the Darksign are reborn after death, and eventually lose their minds, turning Hollow. And so it is they are driven from their homeland." sends you back to the last bonfire used and deleting all souls. This does not drop a bloodstain, and does not hollow you. In inventory from the beginning of the game. Using the Darksign will not affect the bloodstain from your previous death, only your current souls are lost. Does this work while being invaded? A friend and I want to do a Vinland & Astraea Cosplay and this is the closest thing to Astraea commiting suicide. The grammar in the description is wrong. "Carriers of the Darksign are reborn after death, and eventually lose their minds, turn Hollow. And so it is they are driven from their homeland." "Carriers of the Darksign are reborn after death, eventually lose their minds, and turn Hollow. It is this reason that they are driven from their homeland." if you have less than 2,000 souls on you, and an active Ember. and you know ur going to die this is when you use it. Embers are roughly 2k souls. so it&apos;s basically ensuring that u keep ur ember that u already used. It doesn&apos;t kill you, it just deletes your held souls, your ember remains intact if you are embered at the time. so like if your given this at the beginning of the game, shouldn&apos;t you become hollow during the story regardless; i mean hell it says it in the description "Carriers of the Darksign are reborn after death, and eventually lose their minds, turn Hollow." It ensures if you get stuck somewhere you can always get out. Like what if you landed in a corner that had no way out and you had no homeward bones, then you quit the game and were still in the corner with no way out. You can&apos;t revert to a previous save like in most games. It is essential in a game with this type of continuous save system, or it should be anyway. The only reason you should use is: When you died, leaving a great amount of souls, you are trying to retrieve them but you believe you can&apos;t reach them. 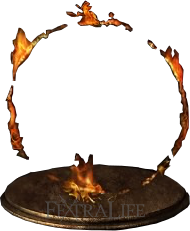 You can use this, you technically won&apos;t die, simply return to the bonfire and lose all the souls (your character owned during the retrival), but the previous Blood Mark (with the great amount of souls) will not disappear. In other words, you lose everything you currently own, but you won&apos;t die, therefore all the Blood marks will remain in the same spot. Why would ANYONE use this ever? They have it in every game, but it is basically just death on command. In what situation is this better than going HAM and dying?? I don&apos;t think I&apos;ll use this. I tend to be too stubborn when it comes to the souls I&apos;ve collected.